Carrington doesn’t use her right hand very often. She mostly relies on her left hand to reach out or pick things up. But today was different. She smiled, gleefully shouted “Yeah” a few times and waved her right hand in front of her as she watched the Silver Tappers twirl, kick and shuffle across St. Mary’s Atrium. The other children, plus teachers and staff, who filled the Atrium were equally delighted. 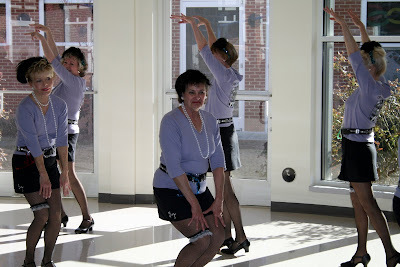 The Silver Tappers is a nonprofit dance company made up of women age 50 and older. 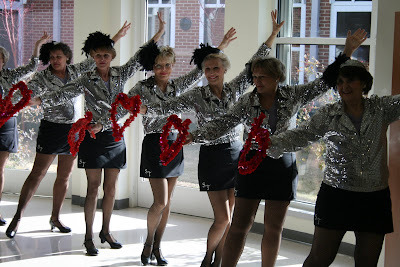 Directed by Rita Joyner of Virginia Beach, the women have been taking dance class together for several years.They donate their time and talent to help charitable organizations. The group has a total of 15 members. Nine women, including Joyner, performed today at St. Mary’s. Their average age? 70. 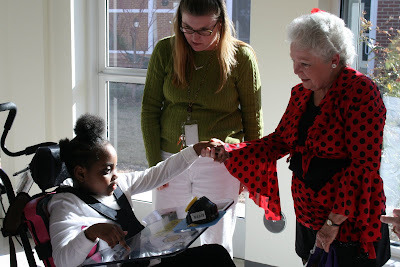 Carrington meets Rita Joyner, director of The Silver Tappers, as Terry Lyle, principal of the school at St. Mary’s, looks on.